We bought this shortly after our daughter was born in 2016. She is 18 months and knows several signs now and communicates primarily through sign. It was a life saver early on before she learned how to point. However, I will say that I feel sign language has possibly stunted her speech development since it is much easier than speech itself. We are still working hard to get her talking, but we rarely have miscommunication issues and I feel we have avoided many tantrums because of sign. I love the flash cards, the books and the poster. She loves looking at the images and trying to copy them. Speech is always the path of least resistance. Baby sign language rarely delays speech, instead it helps children that would have otherwise have slight delays in speech have a means to communicate early on. I never regretted this purchase for a second. If you’re thinking about it, just go for it. We had a lot of fun with the flashcards, which we purchased for our daughter when she was about 12 months old. She picked up a lot of the signs over the next 3-6 months. Then she started saying words, and we stopped using sign language, cuz… well, she was talking. But she still plays with the flashcards (they’re well crafted, and not one has been destroyed). Overall, this was a solid tool to teach and bond with our daughter. I highly recommend you use it, along with other fun letter puzzles, number puzzles, etc., and you can’t go wrong. We loved this kit and recommend it to our friends! We started using the signs on the wall chart (mainly, “eat”, “milk”, “more” and “all done”) with our daughter when she was 4 months. By 6 months she would regularly use them to ask for milk and more of whatever she wanted at the moment. The book that comes with the kit is great for learning the alphabet and numbers too. We bought this kit to educate us, the parents, so we could reinforce the signing that our daughter was learning from our nanny. 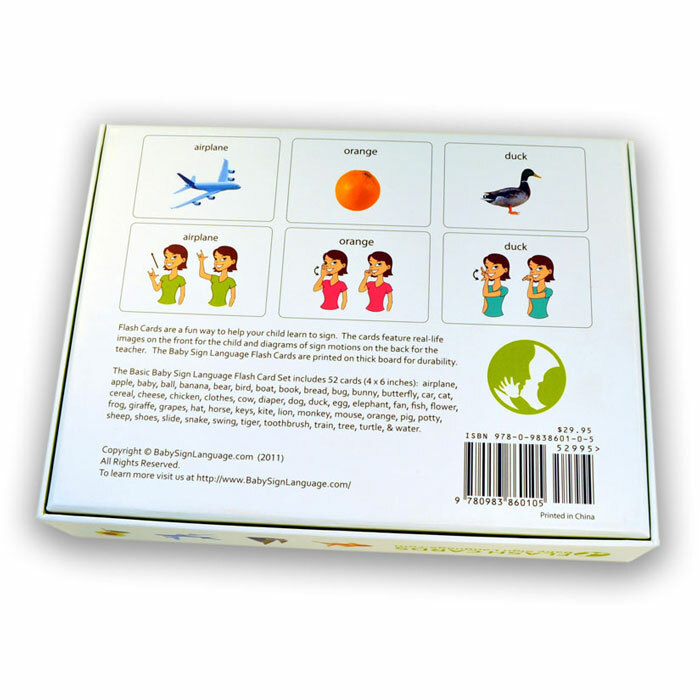 The kit is very comprehensive for educating yourself and teaching appropriate signs to kids. It is a new language (most likely), so don’t expect it to be easy. Taking a 3 dimensional movement and making it a static 2D picture is challenging. You will have to think and learn, but this kit helped us a lot. Especially, the wall chart and the flash cards. Our daughter was signing consistently with 20 plus words by 4 months. 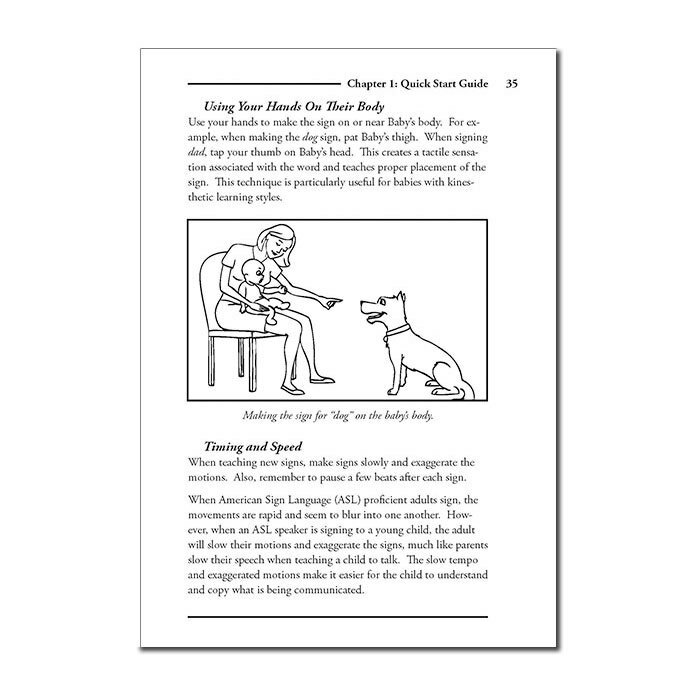 Here is the kicker, if you are committed to teaching an infant sign language, you get the benefit of a happier baby able to communicate their basic needs, and you give your child a jump start on language development. Today, at 4 years old, our daughter is not using her sign language at all, but she will likely skip kindergarten due to her language and numbers and she is picking up Spanish like crazy. It pays off and well worth the modest costs to help educate the parents! I love the concept. I have been using the flash cards and videos. I wish it had an app that teaches the words or have the videos more accessible because I would be able to learn as well as my boy when we are out and about in down time. Love the flash cards they are our favorite. Completly satisfied! I hoped I have got that for my 2firsts kids! So much more understanding of my third’s need! Our two-year-old grandson was having a hard time learning to form words, so we taught him a few basic signs that had helped our son many years ago. He was so excited to be able to communicate specific concepts even though he couldn’t make his words understood! The world opened up to him and he could participate by signing. He caught on very quickly to the signs we taught him through the poster and flashcards. He loves to sit and go through the cards just for fun, and remembers almost all of the signs. Just in the last few months, he suddenly began experimenting much more with sounding words out. It isn’t work to him — it’s a wonderful game that engages him with other people. Since we’ve always combined the signs with the auditory words, we can figure out what he’s trying to sound out because he’s doing the signs for us. 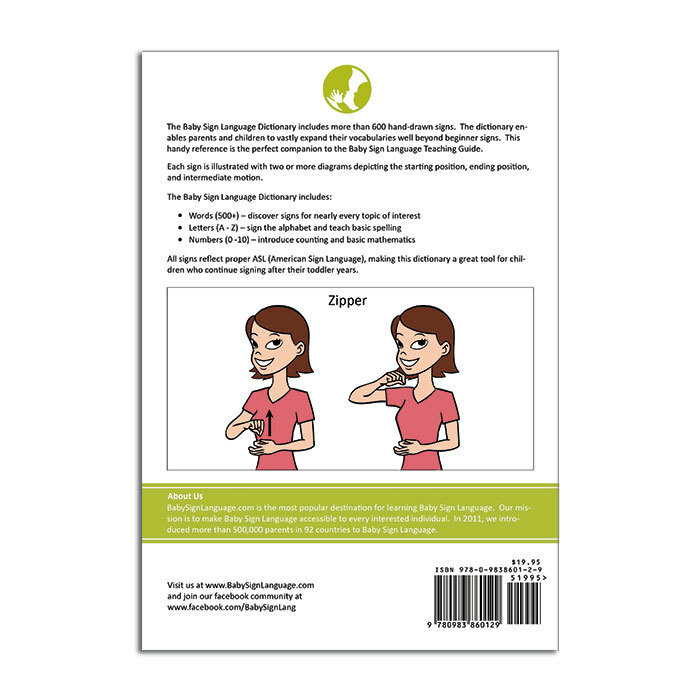 The Baby Sign Language Dictionary is also very helpful, expanding our vocabulary to abstract concepts (“how?”), adjectives, adverbs, and verbs. The dictionary is all nouns, which is an excellent starting point for children anyway. The photographs and artwork are clear and easy to understand, and the signer has a sweet and pleasant manner that charms us all. Our whole family enjoys interacting with our grandson through signs, especially since he is so enthusiastic about it. 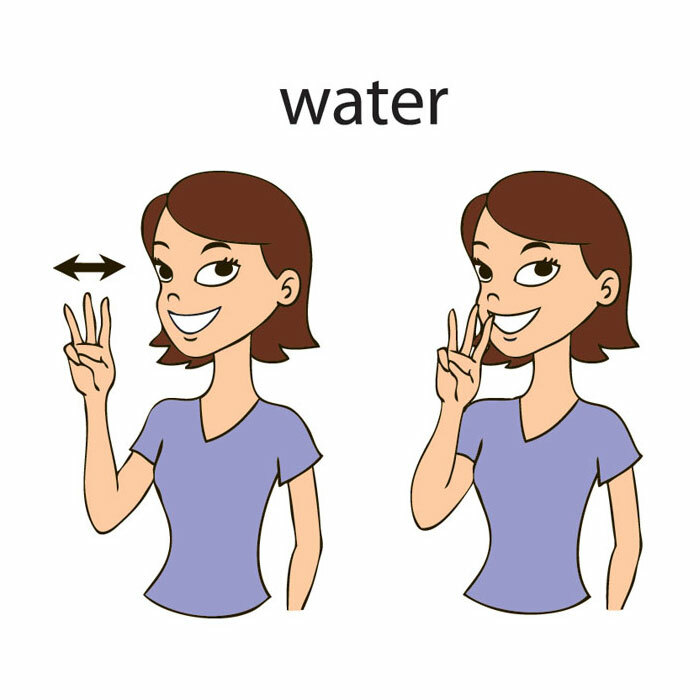 Basic sign language has also been extremely helpful to us over the years when we’ve needed to say something to the kids but couldn’t talk out loud (“sit down” in church, “water!” when in a coughing fit, “come here” across a noisy room, and so much more!). 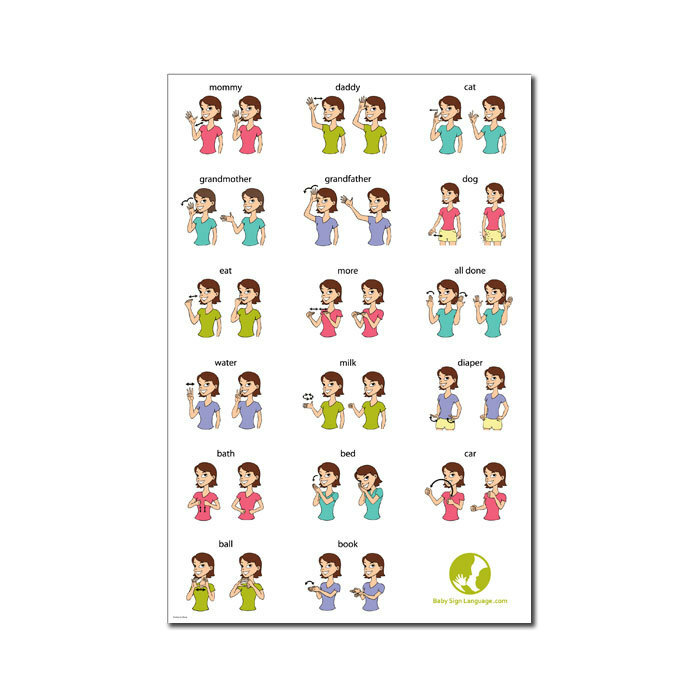 We also have a chart from somewhere else with the alphabet hand signs, and our grandson can recognize many letters on shirts or signs, speak the letter, sign it, and even assign his own nicknames for family members using their initials. You will be amazed to discover the vast amount of comprehension your small child has once you give him the tools to communicate it! 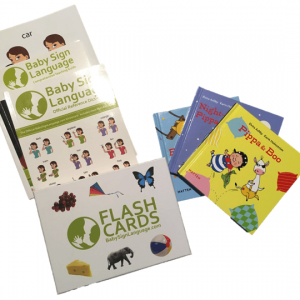 All the Baby Sign Language materials have high-quality construction that makes them durable, attractive, and easy to use. We just LOVE it! This product and whole concept changed our whole parenting experience. It is the best thing we ever did for our daughter – being able to clearly communicate with her from as early as 9months was brilliant. It eased any tantrums and gave us an insight into how differently she viewed the world. I can’t speak or recommend this highly enough! If you have any doubts, forget them – and invest the time to do this for your child and yourself. I love the sign language kit. Great quality products. The flash cards are strong cardboard, which is great for little hands and mouths. Very happy with my purchase. I bought this for my first child (we started late, when she was about ten months old) and now I can’t wait to use it with my second, which is due February. The material is high quality, the flash cards are holding up for THREE years of frequent use. My daughter loves to play with them. First, I would use them to successfully help her learn to sign (unfortunately I didn’t catch that on video). Then, we would use it when she was learning her words and soon moved to using them with her sorting skills (she would sort them into similar colors, shapes, animals, objects). She also likes to use them to “teach” things to people (she copies what I would do with her). Now she is learning a second language and we still use them to learn words. I told her we are going to use them to teach things to her little sister and she is thrilled. So I think that they are going to be used for a few years still. I never used the poster, but that is because we just signed at home (me and my husband) and I didn’t suggest doing it in her daycare. I used the dictionary several times, especially if we noticed that a particular word was important to our family and baby. It was always at hand and ready to be consulted, but I did use the videos a lot, too. 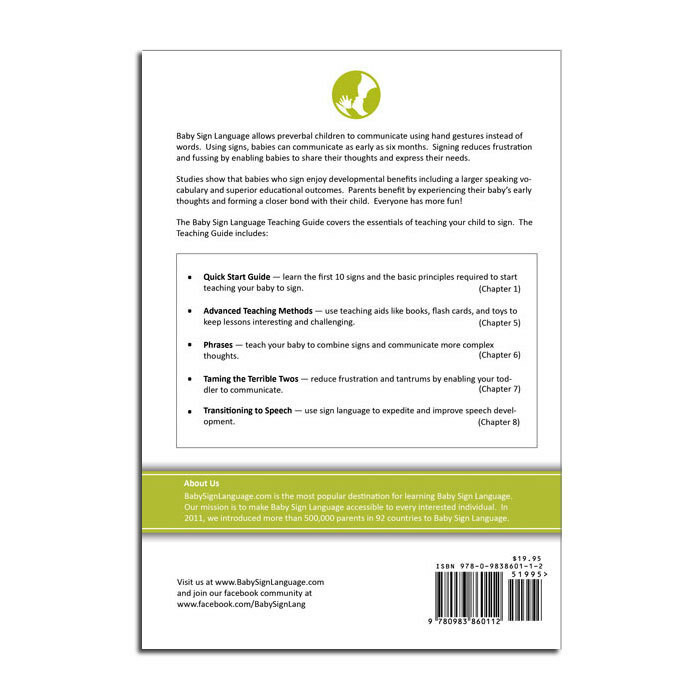 The teaching guide was essential to teach us exactly how to implement baby signing at home and by following the guide it was very easy and we were extremely successful. I feel our daughter did suffer less frustration than she would have without signing, because at one point she would sign almost every conversation. 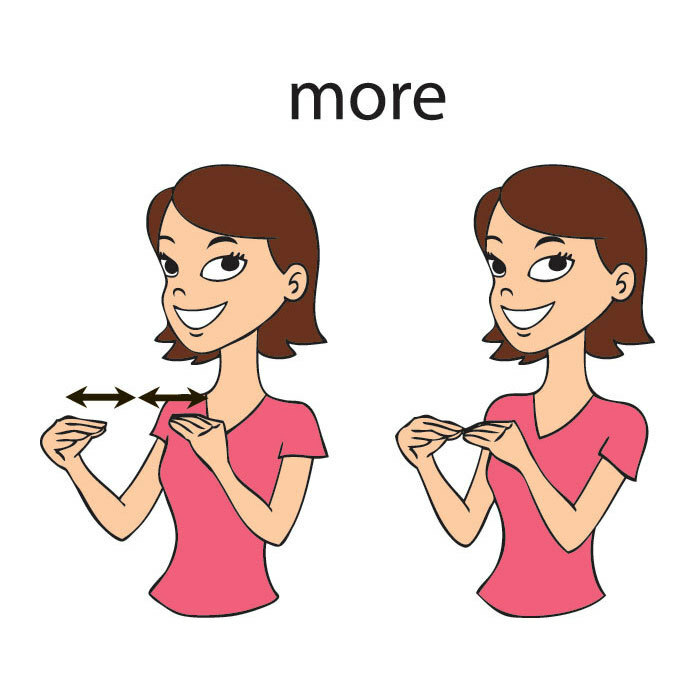 She still uses the “please” sign when she wants to be emphatic (like in pleeeeeaaasseeee – accompanied by the sign). I also noticed that the first words she spoke were the ones she knew how to sign. Ultimately, I am more than pleased with the product and the program. I love the kit. Unfortunately, I can’t use the flash cards with my daughter because she chews on everything. I use Baby Sign Language to gap the bridge between the two languages my daughter is constantly exposed to. I speak Spanish as first language, my mom watches my daughter while I’m at work and she speaks in Spanish to her all the time. My husband does not speak any Spanish at all. Therefore, he speaks in English to our daughter. Sign language has become handy for those times when our daughter is trying to ask for something. It’s been incredible and even moving to see my daughter being able to communicate. And you can see the happiness in her eyes when she sees that we understand what she’s trying to say. I would recommend Baby Sign Language products to any parent any day, most especially when it’s a bilingual home. What a great system! We startted signing when C was 10 months. By 14 months he was communicating his needs with us very clearly! I was amazed by how quickly and eagerly he wanted to learn. Being able to understand what your baby wants can save you so many tantrums! We are a trilingual family and the signing only helped him more. He couls sign with my mom in Spanish, with me in French and with friends in English! (We used the same signs and made sure caregivers were up to date with the signs!) Overall it’s a system I recommend to ALL my friends and family with babies. The kit is complete, it has everything you need. And my son still loves the flash cards! I can’t wait to start baby sign language with my 5 month old. Older brother is very excited as well! This product was super helpful! As a new parent, one of the biggest stressors is trying to figure out Baby’s needs. Signing, in addition to speaking, and then showing, accelerated our communication. What a relief! Try it – it works. I love Baby Sign Language! I started signing to her at around 6 months and it took a few months for her to sign anything back, but she still understood them. Sometimes I will sign something many times with her never doing it herself and then out of the blue she’ll see that thing and do the sign. So she absorbs it but just waits to reciprocate sometimes. Right now, at 21 months, she knows about 40 signs and uses them all the time, since she doesn’t yet speak too much. She is easily able to tell us what she needs and it has made her very confident and much less frustrated. My husband questioned teaching her signs at first, but the first time he didn’t know what she wanted and she was able to tell him that she wanted to eat, he was a believer. I strongly feel that it has kept her from having tantrums as well, since we understand her and she can express herself. She makes up her own signs for things sometimes, too, if the real sign is too hard for her or I don’t know what the right one is at the time. She also loves the flashcards and can sign them just from the pictures without me saying the words. What a valuable resource, I highly recommend it! My baby absolutely refused to learn sign language, no matter how consistently we performed all the signs, which we memorized easily thanks to the placing the supplied materials throughout the house. Also, he cried all the time, and pooped a lot, and wouldn’t sleep, and keeps pulling the cat’s tail to this day (#1456, give or take.) Nevertheless, it wasn’t for any fault of the Standard Kit, which was a terrific product. We purchased this kit when our twins were only a few months old in the hope that it would allow earlier communication and help us to avoid tantrums. It lived up to expectations and more. Even with just a few basic signs like “eat”, “drink”, “more”, we were able to discern what they desired faster and they were so happy that they could tell us their needs. They love the flash cards and even now that they are two years they still enjoy playing with them. Some are chewed around the edges, but none are bent or broken. Now that our twins are older we have progressed to the older Signing Time videos are they love them too. I even saw my daughter singing the theme song to herself and doing the signs along with the verbal singing. I would highly recommend Two Little Hands products to anyone. 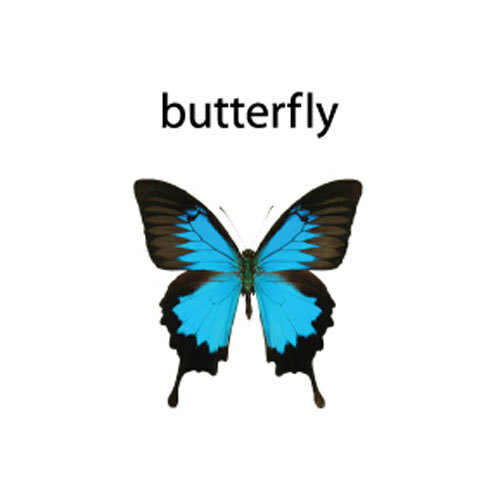 It is a very engaging and enjoyable way for both children and adults to learn sign. The flash cards are great, I think the poster COULD be helpful if you have lots of different people caring for your baby. The manual is possibly helpful too for some ideas and guidance but the dictionary seems like excess since even in the book it suggests to look online at the video for an example. I ended up referring online to the visual example as the printed ones’ sometimes didn’t quite make sense to me. I purchased the flash cards, the teaching guide book, and the wall chart. The flash cards are probably one of the favorite products I have ever purchased for the kids. We are a multi-language household, and I have used these with the kids for various languages, including sign language. The product is extremely well made. 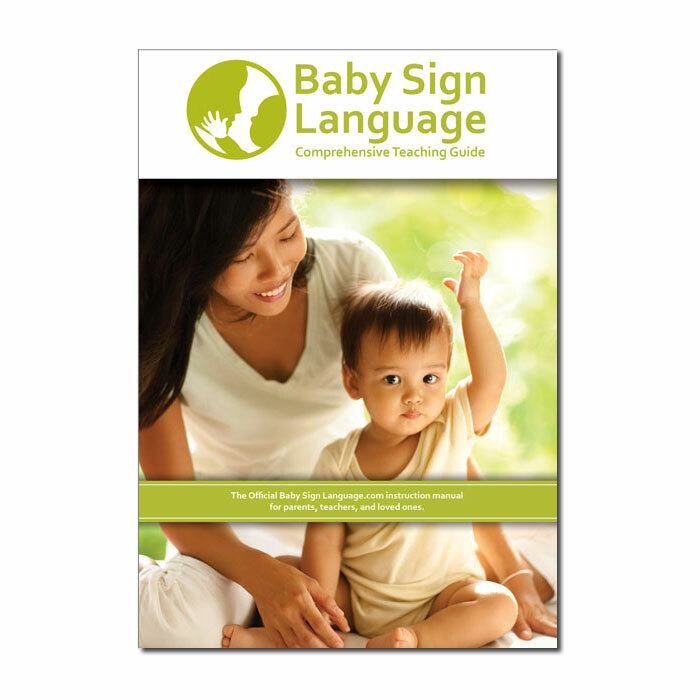 We started using the Baby Sign Language Standard Kit with our little one at around 4 months. At first, he seemed to just enjoy ‘hand game time’, laughing and smiling but not really understanding we were trying to communicate. After about a month, little Tintin realised it was more than a game and after 6 months of use, he’s pretty good with ‘milk’, ‘water’, ‘nappy’ and ‘sleep’. There are others that he uses occasionally, but these four are regulars… and at his age, those four magic words cover a lot of situations! My one regret, should have started the little one on it earlier. Ultimately, loved the product so much, bought one for my sister! My wife and my sister got pregnant around the same day – double happiness! Thank you Lila and the Baby Sign team. 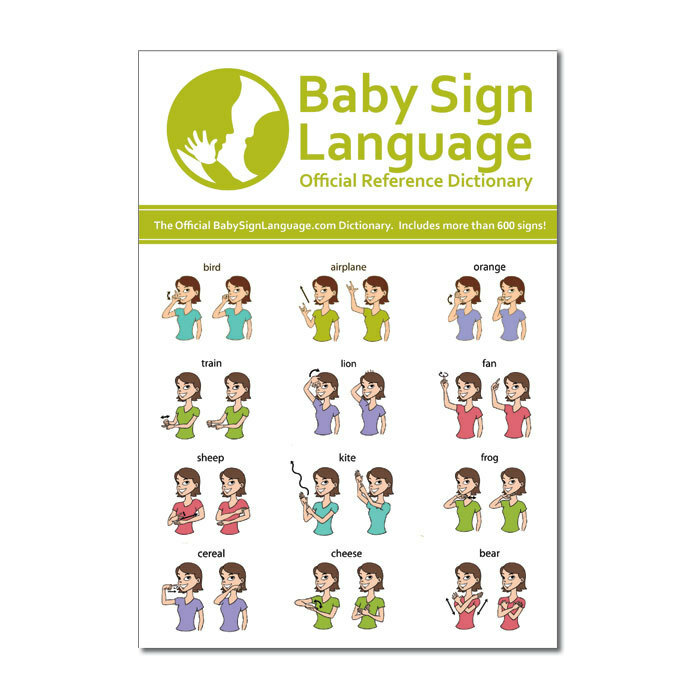 I bought the standard baby sign language kit for my twin 2 year old girls. They were having significant speech delay and we were experiencing a lot of speech frustration through out the day. I’m happy to report this program helped us tremendously. My girls picked up the signs quickly! And the flash cards are brilliant. My husband and I even used them on a long car trip to learn all the signs. Baby Sign Language truly picked words a baby/toddler uses frequently. Not sure why, but I thought I was getting a video with the set that I ordered. To be honest, the illustrations are a little difficult to follow for someone brand new to signing. I saw the Rachel Coleman video recently advertised, that looks wonderful, and I wish I would have spent the money on that instead, but now I am hesitant to spend more money here as the money I already spent is pretty much wasted. I am going to look for the PBS show. Sorry to hear about your experience. As with all of our customers, we are happy to provide you with a full refund. Just drop us an email at [email protected] or call at (855) 827-5275. Overall, this kit is a great introduction to sign language. I bought this and started teaching my daughter at around 7 months of age. It took her a few months to catch on, but now at 16 months, her ability to communicate through signs is truly incredible! She seems to be able to communicate about 80% of what she wants to say, which really cuts down on her frustration level (and mine!). 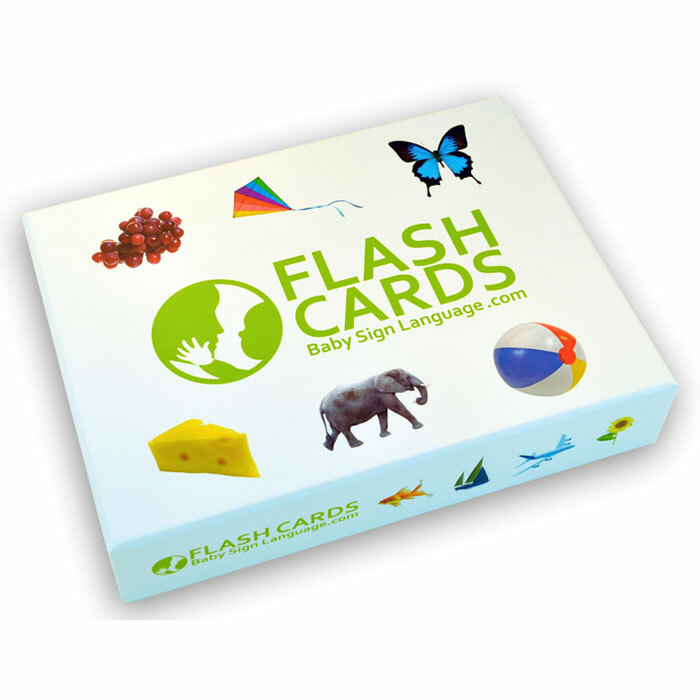 The flash cards in this kit are very sturdy and fun for her to practice her signs with. The sign dictionary is also an invaluable resource and something I reference often when I know she is ready for a new sign (seems like she adds 1-2 new ones a day lately). I will say that I wish this kit came with videos– I don’t let her watch very much TV, but I did purchase her some sign videos from another site (Baby Signing Time) that I thought were are a great complement to this deluxe kit. Overall, I am very pleased with this purchase! Very pleased with our sign language kit. There’s a great guide book on how to incorporate signing into daily lives. Its easy to use and thorough. Happy with our purchase.